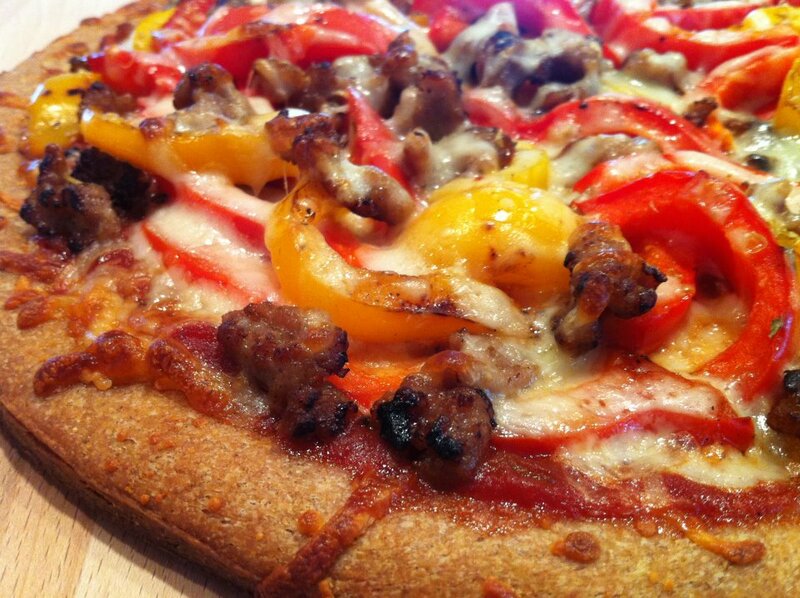 One cup of Saturday’s Basic Marinara Sauce, some colorful veggies, and a little sausage make for tasty pizza toppings. A store-bought whole wheat thin crust makes for dinner in a flash. Why take out when you can have this? Hint #1: I like to put the toppings directly on the sauce then sprinkle the cheese over them for maximum flavor and “cheesiness” with a minimal amount cheese. Hint #2: If you do not have a pizza stone, you can achieve the same crisp crust by very carefully sliding pizza directly onto oven rack. Use a cookie sheet with no edge and gently slide off then back on after cooking. Brown sausage in lightly oiled skillet; add peppers and sauté over medium-high heat, 3-4 minutes, or until slightly seared but still crunchy. Place pizza crust on a baking stone or cookie sheet. Mix marinara sauce with tomato paste and spread evenly over crust, leaving 1/2-inch border. Top with sausage and pepper mixture. Then sprinkle with cheeses and oregano. Bake at 450 degrees for 12-15 minutes or until cheese melts and crust in lightly browned. Let stand 5 minutes before slicing. I tried a recipe a couple months ago much like this only with no meat and had 3 colors of peppers, red, green, and yellow and it was great. I am going to try this recipe because I think it will be great with a mild spiced sausage. Thank You! I hope you enjoy! Thank you for letting me know!